These elegantly simple bracelets are exact replicas of Viking age silver artefacts known as 'ring money' because of their assumed use as trading tokens. The originals were found near Lough Sewdy, Co. Westmeath. They are on display in the National Museum of Ireland and date to 9th / 10th Century A.D. 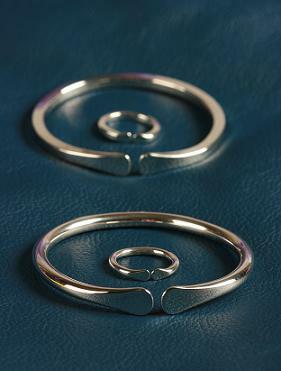 The matching rings are simply miniature versions of the original bracelets.